The Winter Art Fair will celebrate the work of an eclectic gathering of Euroartists and guests, promoting a diverse range of artistic practices. It will be the perfect place to snap up affordable works of art and unique Christmas gifts. The fair will offer paintings, collages, sculptures and ceramics, books, limited edition prints, gift cards, T-Shirts and lots more. 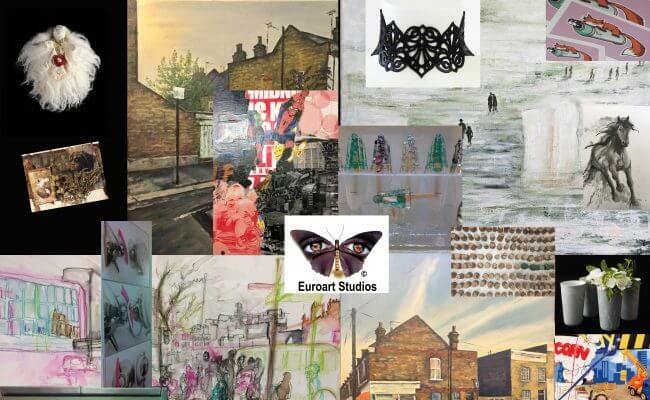 Euroart Studios are North London’s largest artist-led art studio and workspace complex, providing affordable studios and workspaces for rent by artists, makers and creative practitioners. Only 5 minutes walk from Seven Sisters Tube station, the complex of 70 studios boast an eclectic mix of talented creatives: painters, sculptors including SFX, mixed-media & installation artists, ceramicists, milliners and costume makers, fashion designers, filmmakers, photographers, graphic artists, puppeteer, composers and more. Euroart Studios are committed to bringing contemporary art practice to the local community, delivering activities enabling people to participate in artistic and creative experiences. They have delivered creative workshops across the borough, including Bruce Castle Museum, West Green Learning Centre, Friends of Markfield Park and North London Chamber of Commerce.